Today we’re embarking on an epic quest: that of reviewing all cards in South Park Phone Destroyer. In our reviews, we will talk about everything we need to know about the said card – tips on how to get the most out of it, combos to make it stronger and how to counter that card in case your opponent plays it. We’re going to start with one of the most popular cards in the game, especially early on, mainly because it’s the first and only tank we’ll have for a while: Sheriff Cartman. So let’s move on and check out this South Park: Phone Destroyer Sheriff Cartman card review below so you get a better understanding of how it works. A tank with decent health and low attack, Sheriff Cartman has a charging bonus that allows him to damage all enemies that are close enough to him. As you can see, his stats grow nicely and he becomes pretty useful at level 3 and above. 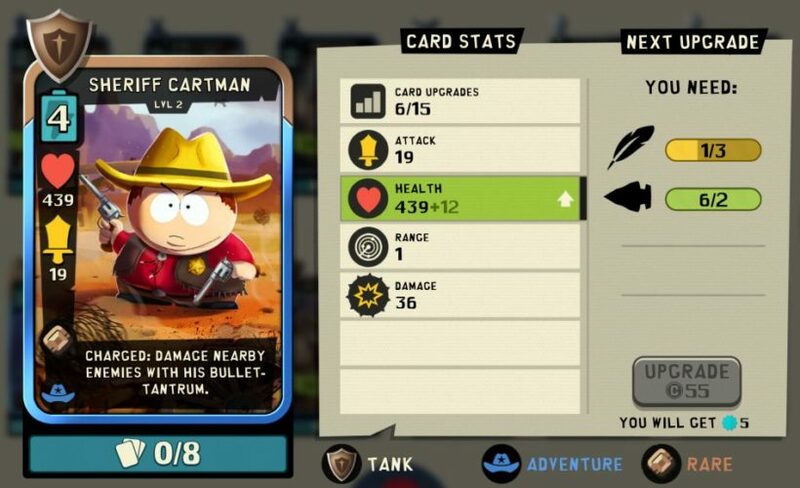 The best part about upgrading him is that it’s relatively easy, since everybody has Sheriff Cartman cards (so you can get them from your alliance members) and easily win them as you play. When it comes to playing Sheriff Cartman, you want him up front, holding up enemies and allowing those in the back to deal damage and take them out. Therefore, it’s a good idea to use him in combination with ranged units and go for the classic strategy: put a tank forward and a ranged unit at the back. This works great and you can even pair him up with an assassin or damage dealer to go through the enemy troops easier. Like most tanks out there, the easiest way to counter him is by sending an assassin his way. You can also counter him with a Rat Pack of Pigeons, but be very careful with these because if he manages to fully charge, he’ll take them all out without a problem! 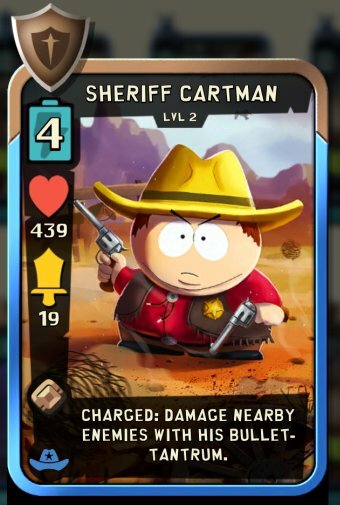 Although not one of the best cards in the game, Sheriff Cartman is a really good card to have early in the game and you will most likely use him for a while until you get better tanks. He can help you a lot in battle and I prefer him over the next immediately available tank you unlock in the game, Mimsy. What do you think about Sheriff Cartman, though? Is he a solid card to have in your deck or you don’t like him too much?